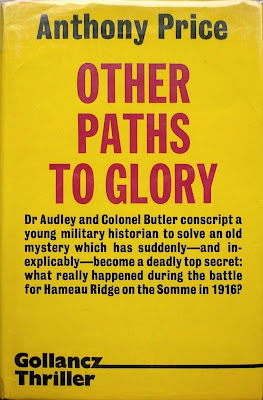 First published by Victor Gollancz in 1974, Other Paths to Glory introduces a new character to Price's series in the shape of Paul Mitchell, a World War I researcher at the British Commonwealth Institute for Military Studies. Mitchell is interrupted at work at the novel's outset by Dr. David Audley and Colonel Jack Butler of the Ministry of Defence's Research and Development Section – although Mitchell is initially unaware of their provenance – who present him with a photocopied map fragment showing German trenches in the Somme and then enquire after the whereabouts of Mitchell's boss, Professor Emerson. Later, on his way home, Mitchell is set upon by unknown assailants and thrown into a dangerous river, only escaping with his life due to becoming inadvertently wedged under a bridge. After finally extricating himself, and with no sign of his attackers, Mitchell arrives at his house to find his mother attended by a policeman and clutching a suicide note – one purporting to be from Paul himself. Furthermore, he's informed that Professor Emerson was killed earlier that day in a fire. 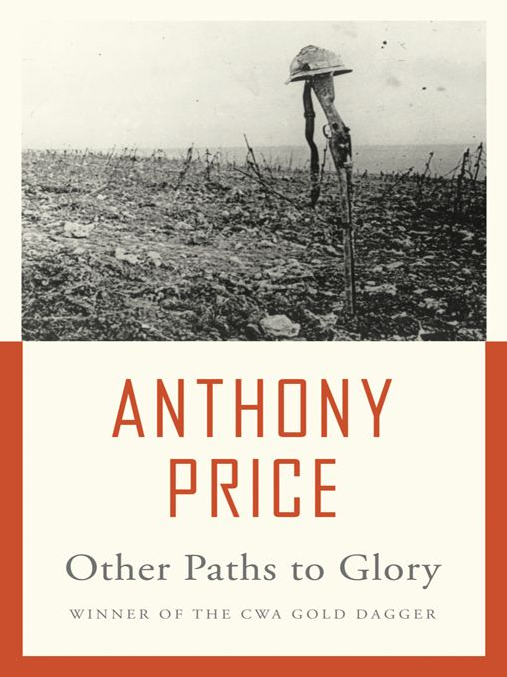 There's a telling line in Other Paths to Glory, when Audley remarks to Mitchell that "the past is always waiting to revenge itself on the present" (a line Anthony Price himself is fond of reiterating). It's a useful summation of the modus operandi of Price's novels, but it's also slightly misleading, in a couple of ways. For one thing, although Mitchell, Audley and Butler must follow the historical threads in Other Paths to Glory in order to reach the truth, that truth – and its attendant threat – is very much in the here and now – or rather, the then and now, i.e. the early 1970s. As Price explained when I met him last year, back then, for him, as for others, Communist Russia and China represented a clear and present danger (he memorably characterized himself to me as a "Cold War warrior"), and Audley and co.'s adventures were his way of addressing that menace. For another thing, there's a kind of reverse-engineering going on in Price's fiendish mysteries. Plot-wise, the starting point for Other Paths to Glory is the Somme of the First World War, but the story really begins – unwitnessed by the players – in France in the "present" day. Mitchell and Audley may follow the path of deduction from the past, but in fact the way is paved from the other direction – indeed from Bully Wood itself, now ringed by an electrified fence and hiding a potentially lethal secret. 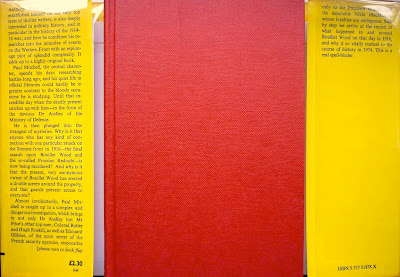 As he did in the previous three novels – The Alamut Ambush (1971), Colonel Butler's Wolf (1972) and October Men (1973) – each of which was related from the perspective of a protagonist other than Audley, Price again distances Audley in Other Paths to Glory, adhering firmly to Mitchell's viewpoint and thus making Audley more inscrutable and enigmatic than he would otherwise appear. 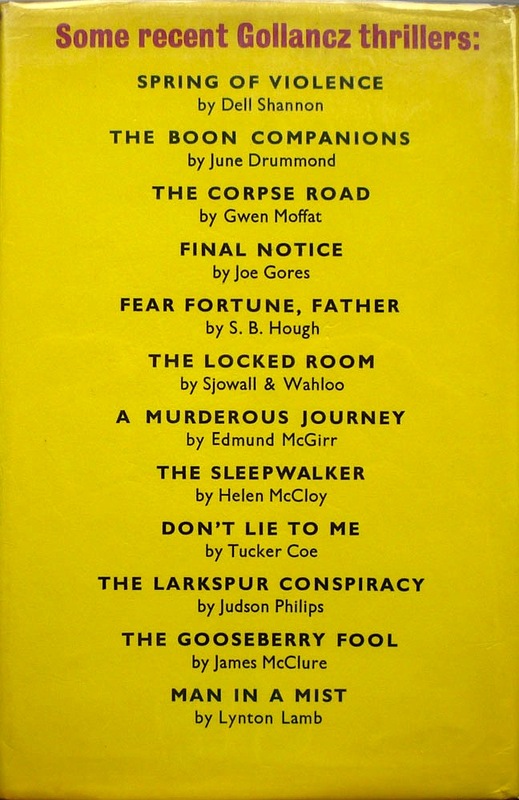 There's a good reason for this narrative choice: Audley is invariably the cleverest man in the room, and usually three paces ahead of anyone else, which was why in the first novel in the series, The Labyrinth Makers (1970) – told, remember, from Audley's point of view – the withholding of information which was necessary in order for the mystery to work became more conspicuous. In Other Paths to Glory, however, Audley only tells Mitchell – and consequently the reader – what he needs to know, so that any concealment on Price's part is less noticeable, more natural – although it must be said that Audley is himself often in the dark. But Mitchell also inherits Audley's role from The Labyrinth Makers, in that here Paul is the neophyte field man, propelled into perilous situations beyond his control. As such, his perspective on the other characters – Audley, the irascible Butler, and even Hugh Roskill, here making only a brief appearance after the traumatic events of The Alamut Ambush – is both illuminating and frequently amusing, their conversations – those pages of puzzle-solving dialogue that are the hallmark of Price's novels – as deliciously engrossing as anything from the four prior books. 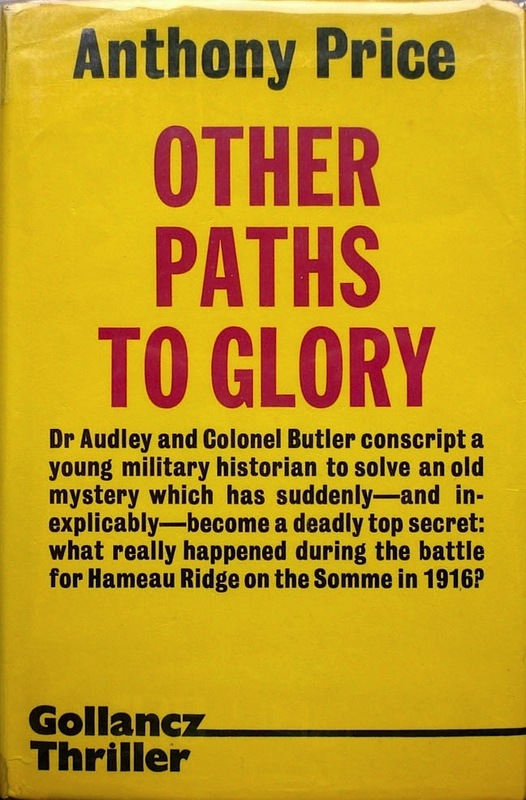 Other Paths to Glory is a cracking spy thriller: brainy, gripping, scholarly in its grasp of the minutiae of the Great War – witness the testimonial on the right – and a fine whodunnit to boot; it's easy to see why it claimed the Crime Writers' Association Gold Dagger for 1974 (going one better than The Labyrinth Makers, which had to settle for a Silver Dagger). 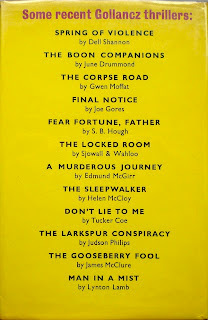 Moreover, unlike many of the books I blog about, it's still in print, and readily available as both a paperback and an ebook. Not all of Anthony Price's books were reprinted in the States. I had to go to Canada to find a couple books in the series. But they were well worth it! Quite so, George. I don't think I've ever had to stray outside the UK for the Anthony Price books in my collection, but they've certainly come from all over Britain (via various online retailers, that is). I've got a couple of Price's books on my shelves, probably as a result of the short-lived series CHECKMATE in which Terence Stamp played Audley, but have yet to make the leap. Really enjoyed this post so consider me finally convinced! You occasionally find Price books in used bookstores in the US, but it's rare to find more than one in a store, and most of my Prices I've had to get from ABE. I've managed to pick up about half the series by now, but I'm a little behind on actually *reading* them. Sergio: Good to hear! Let me know how you get on with whichever Prices you have on your shelves. Matt: A familiar story, at least to me; I have a tendency to become interested in a writer and then buy as many of their books as I can get hold of, without having read more than one. Luckily, I'm rarely disappointed when I read those later books – Anthony Price being a case in point. Somehow I knew you'd understand "stockpiling" authors. I've read Price's first two and really liked them, and since I like archaeology, espionage, and the British, I'm expecting a lot from the rest of the series. Now that I've finally finished Len Deighton's Samson series, I think Price will be my next spy pick. I don't think you'll be disappointed in the next few books, Matt; Colonel Butler's Wolf is great, and though October Men isn't quite up there with the first three in the series – or Other Paths to Glory – it's still a damn fine novel. I've decided to join the Price party, just got hold of Labyrinth Makers this morning on-line. My resolve to stop buying books is waning! That's the trouble with Existential Ennui, Col – my enthusiasm is infectious! Glad you've decided to give Anthony Price a go.